Christ the King Church will present its annual bazaar fundraiser from 9 a.m. to 3 p.m. Saturday at the church campus in Kahului. This benefit for the church facility and preschool development program will feature live entertainment, food, games, a country store, rummage, silent auction, craft fair, plant sale and more. There will be free parking available from the Puunene Avenue entrance. Mistresses of ceremonies will be Kathy Collins and Lehua Bissen. Maui Taiko will open the event. Other entertainment includes the Kuikawa Trio and Nevah Too Late, as well as the preschool students and community members. Food choices include pasteles plate, poke bowl, tacos, huli-huli chicken, home-style heka, pancit, pork adobo and local standards. The country store will be stocked with farm fresh vegetables and baked goods. Parents and the community are invited to join the Wailuku Elementary School Community Council meeting from 5:30 to 6:30 p.m. Tuesday at the school library. The agenda includes a preview of the accreditation report for an upcoming visit on March 28, a progress report for the first semester on the academic and financial plan, and a student report. Council approval may be requested for waiver days for 2019-20 in conjunction with other schools in the Baldwin complex. Akaku Maui Community Media invites Maui County residents to join a studio production class beginning Wednesday at Akaku’s Studio “A” at 333 Dairy Road, Suite 104, in Kahului. This class will provide participants with a basic understanding of all the roles involved in putting on a show. The class will be from 4 to 7 p.m. Wednesday, Friday, Feb. 13 and 15. The fee for this class is $200 for adults, $160 for Akaku Producer Associate members and $100 for youths 18 and younger. Register by visiting Akaku or call 871-5554 or visit akaku.org/classes. Certified graduates of this class are invited to become Akaku Producer Associate members and reserve Akaku’s Studio “A” to produce their own programs for cablecast on Akaku’s community access TV channels. “Introduction to Akaku and Public Access Media,” a two-hour class, is a prerequisite for all of Akaku’s video production classes and also includes a tour of Akaku’s studios and facilities. Introductory classes will take place from 4 to 6 p.m. on Feb. 11 and 25 at Akaku Upstairs, 333 Dairy Road, Suite 205 (above the studios). Sarah Sorensen, founder and director of “Wishing Well for Maui Students,” will be guest speaker at the noon meeting of the Rotary Club of Kihei Wailea at noon on Wednesday at Mulligans on the Blue. The Hawaii Alpha Delta Kappa, Gamma Chapter will hold a rummage sale from 7 to 11 a.m. Saturday at the Lihikai Elementary School cafeteria. Clothing, household items, toys, books and other items will be available. Proceeds of the sale support Gamma Chapter’s organization, including providing scholarships to high school seniors. ADK is an international organization of women educators dedicated to improving education and the teaching profession, increasing world understanding and making a difference in the community through altruistic work. Maui High School Team 1 placed fourth at the 26th annual Hawai’i Science Bowl on Jan. 26 at Honolulu Community College. The team secured a $200 cash award for its respective science departments. From a competitive field of 20 teams from 14 high schools statewide, ‘Iolani School garnered the championship title. The teams faced off in a fast-paced question-and-answer format similar to the TV game show Jeopardy, being tested on a range of science disciplines including biology, chemistry, earth science, physics, energy and math. 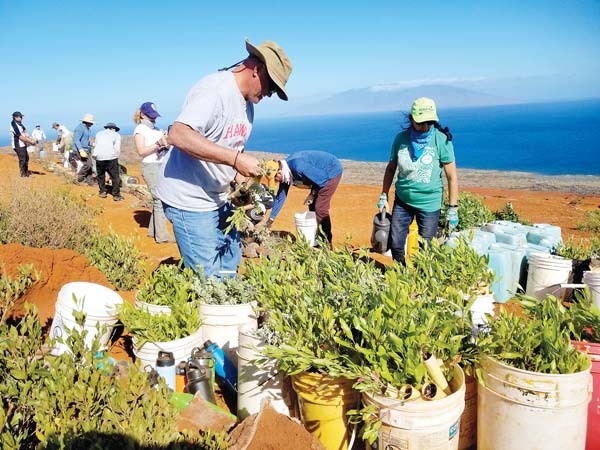 Lokelani ‘Ohana Farm, located at 2315 Kahekili Highway in Wailuku, invites the community for tea and treats from 1 to 3 p.m. Saturday. The event includes strolls through the biodynamic farm, organic face-painting for children and adults, and saori weaving with program director Dana Allen. Hawaii Public Radio will present a live reading of local literature during a reprisal of its “The Best of Aloha Shorts — Live!î” program at 7 p.m. Saturday at the Kamehameha Schools Maui Keopuolani Hale Auditorium in Pukalani. Among the readers for the evening of readings is Maui performer Kathy Collins, who will reprise her reading of Michael McPherson’s poem remembering the Maui institution and Kahului Shopping Center fixture “Toda Drugs.” The featured musician will be Pat Simmons Jr., a singer/songwriter raised on Maui. He’ll be performing some of his original work from his debut album,ì“This Mountainî,” one song an homage to Haleakala. Reservations may be made at www.hprtickets.org or by calling the station at (808) 955-8821 during regular business hours. VIP tickets include a preshow reception. Aloha Shorts was a half-hour weekly radio program co-produced by Hawaii Public Radio and Bamboo Ridge Press between 2004 and 2012. Roots School has announced that its eighth annual Children’s World Fair will be held from 2 to 6 p.m. Saturday on the oceanfront at 65 Hana Highway in Paia. Parking will be available in the public lot directly across the street. The Children’s World Fair features pony rides, a bouncy castle, face-painting, balloon-twisting, food from Flatbread Co. and student performances. A silent auction will have packages from the Four Seasons Resort Maui, the Grand Wailea resort, the Kahala Hotel & Resort, as well as dining, spa, activities and gift baskets. All proceeds benefit the Tuition Aid Program at Roots School. Roots School is a private, nonprofit institution in Haiku serving children from preschool to 8th grade. For more information, go to www.rootsmaui.org.